3x M18B5 M18 5Ah Red Lithium-Ion Battery. M18FPD-0 18v Body Only Fuel Brushless Combi Drill Driver. M18FID-0 18v Body Only Fuel Brushless Impact Driver. M18CCS55-0 18v Body Only Fuel Brushless 165mm Circ Saw. Includes: (1) contractor bag, (1) M18 compact ½ in. circular saw (2630-20), (1) M18 ¼ in. hex impact driver (2656-20), (1) M18 cordless 4-1/2 in. The Milwaukee M18 18-Volt Lithium-Ion Cordless Combo Kit (6-Tool) has all the tools you need to tackle a wide range of drilling, driving, cutting and grinding applications. 5 out of 5 stars - Milwaukee 2696-26 M18 18V 6-Tool Cordless Combo Kit Circular Saw Impact - NEW !! 21 product ratings21 product ratings - Milwaukee 2696-26 M18 18V 6-Tool Cordless Combo Kit Circular Saw Impact - NEW !! Battery Technology RedLithium. 1 x 18V Brushless Combi Drill 135Nm. 1 x 18V Brushless Impact Driver 203Nm. 1 x 18V Brushless Reciprocating Saw. 1 x 18V Brushless Circular Saw. 1 x 18V Brushless 4½” Angle Grinder. Compatibile with M18 XC High Capacity REDLITHIUM Batteries and M18 Compact REDLITHIUM Batteries. 18-Volt 160-Mph Cordless Compact Blower - 0884-20. 18-Volt Cordless LED Work Light - 2735-20. Heavy-Duty Magnesium Guards for maximum durability. M18 FPP2K-544X. M18 FUEL™ POLISHER. Flexible battery system: works with all Milwaukee® M18™ batteries. M18 FAP180-0. M18™ 5.0 AH BATTERY. World´s first cordless polisher with 8 position variable speed selection ranging from 360 - 2200 RPM. · All photographs on the site are for illustration purpose only and reasonably represent the goods being sold. Incorrect information will cause a delay in processing the order. The order will only be processed once authorization of the credit card has been properly received. 1 x 18 Volt 165mm HD18 CS Cordless Circular Saw with powerful motor to easily cut most timber construction materials. With Magnesium upper and lower guards for impact resistance and REDLINK™ overload protection for durability. M18ONEPD-0 18v fuel one key combi drill. 2 x M18B5 18v 5.0Ah batteries. M18CAG115XPDB-0 M18 fuel angle grinder. The Milwaukee M18BPP3B-423B cordless 3 piece kit consists of an HD18CS Circular Saw, M18BJS Jig Saw and M18BMT Multi-tool. 1 x Milwaukee Contractor BagProduct Specifications. 4-position orbital cutting provides versatility for application-specific cutting. Connect via Bluetooth® with the Milwaukee® ONE-KEY™ app. Flexible battery system: works with all Milwaukee® M18™ batteries. Milwaukee® designed and built brushless POWERSTATE™ motor for up to 2x longer motor life and up to 25% more power. The 2493-24 M12 cordless Lithium-Ion 4-tool combo kit includes the 3/8 in. Drill Driver (2410-20), 3/8 in. Square Drive Impact Wrench (2451-20), 1/4 in. Ratchet (2456-20) and Work Light (49-24-0145). The 2896-22 M18 FUEL Cordless 2-Tool Combo Kit includes the best performing Drywall Screw Gun and Hydraulic Driver Kit on the market. With 4,500 RPM's the tool is faster than corded. Also included is the M18 FUEL SURGE 1/4 in. 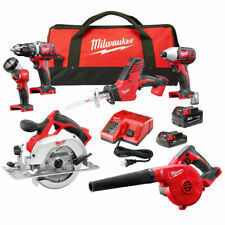 The Milwaukee M12 12-Volt Lithium-Ion Cordless Combo Kit (5-Tool) includes M12 drill driver, M12 1/4 in. hex impact driver, M12 HACKZALL, M12 multi-tool, M12 LED Light and 3 M12 batteries. Includes: M12 drill driver 2407-20, M12 1/4 in. 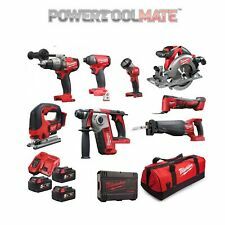 5 out of 5 stars - Milwaukee 2499-25P M12 12V Lithium-Ion Cordless Combo Kit (5-Tool) - NEW !!!!! 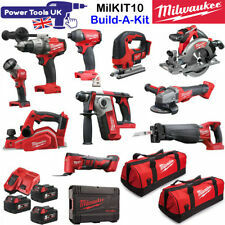 5 product ratings5 product ratings - Milwaukee 2499-25P M12 12V Lithium-Ion Cordless Combo Kit (5-Tool) - NEW !!!!! The Milwaukee M18BPP3B-423B cordless 3 piece kit consists of an HD18CS Circular Saw, M18BJS Jig Saw and M18BMT Multi-tool. 1 x Milwaukee Contractor Bag. 4-position orbital cutting provides versatility for application-specific cutting. Designed specifically for Uponor ProPEX, the M12 Cordless Lithium Ion ProPEX Expansion Tool is built to make effortless installations. 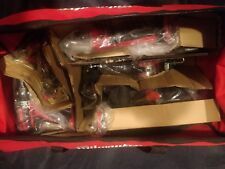 New Milwaukee 2432-22 Cordless M12 ProPEX Expansion Tool Kit. The M12 Cordless Lithium Ion ProPEX Expansion Tool features an auto-rotating head for convenient one-handed operation. M18 Compact 1/2 in. M18 SAWZALL Recip Saw - 2620-20. M18 1/4 in. Hex Impact Driver - 2656-20. M18 Work Light - 2735-20. Part of the M18 System of over 150 tools. Series: M18. Batteries in Kit: (2) M18 REDLITHIUM XC3.0. 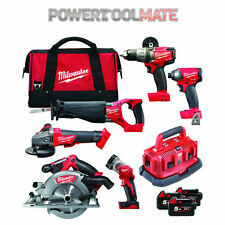 M18 Cordless LITHIUM-ION 4-Tool Combo Kit 2696-24 includes the M18 ½ in. Hex Impact Driver (2656-20), and M18 LED Work Light (2735-20). M18 1/2 in. of torque, 0-400/0-1,800 RPM and 29,000 BPM. The 2499-24 M12 Cordless REDLITHIUM 4 Tool Combo Kit includes the 3/8 in. Drill Driver (2410-20), HACKZALL® Recip Saw (2420-20), Copper Tubing Cutter (2471-20) and Work Light (49-24-0145). M12 3/8 in. An integrated quick release removable harness with an integrated canister hook to allow the user to wear, hang and carry the canister vacuum for ultimate cordless cleaning versatility on any jobsite. The M18 Brushless Cordless FUEL D-Handle Jig Saw combines power, blade speed and precision, to provide the highest quality cuts in a wide variety of materials. Leveraging the M18 REDLITHIUM XC5.0 battery the M18 FUEL D-Handle Jig Saw provides up to 105 lin. The 2893-22CX M18 2-Tool Combo Kit includes the 1/2 in. Hex Compact Brushless Impact Driver (2850-20). Includes A Free M18 HACKZALL Reciprocating Saw (2625-20). of torque. The M18 1/4 in. Includes a free M18 HACKZALL reciprocating saw (2625-20). The 2695-24 M18 Cordless 4-Tool Combo Kit includes the M18 1/2 in. Hex Impact Driver (2656-20), and M18 Work Light (2735-20). Includes: (1) contractor bag. (1) M18 compact 1/2 in. Includes: 2607-20 M18 1/2 in. New. Box has been opened to verify contents. ​Please see photos for further detail. Includes everything showed in pictures. If something is not clear please contact us. ​Feel free to ask any questions. The 2695-25P M18 Cordless 5-Tool Combo Kit includes the M18 1/2 in. Hex Impact Driver (2656-20), M18 6-1/2 in. Circular Saw (2630-20), and M18 Work Light (2735-20). Includes A Free M18 18-Volt Lithium-Ion SAWZALL Cordless Reciprocating Saw (Tool-Only)(2621-20). Milwaukee 2997-23 M18 FUEL 18V Brushless Cordless Combo Kit w 2XC5.0 Batteries Up to 60% more Power. Flexible battery system: works with all Milwaukee M18 batteries. Milwaukee M18BMT-0 Multi Tool Unique dust extraction kit to keep the work space dust-free when connected to an AC or DC extraction system. Of maximum torque and 0-600/0-1800 RPM, reciprocating saw with variable speed trigger provides two levels of speed range: 0-2000 and 0-3000 strokes per minute, features a 1-1/8 in. 28 VOLT CORDLESS TOOL KIT. Condition is New OPEN BOX TO VERIFY CONTENT. Includes: 1 M18 FUEL SURGE 1/4 in. The M18 FUEL SURGE Brushless 1/4 in. hex Hydraulic Driver is the quietest cordless fastening solution on the market. with Milwaukee's new FLUID-DRIVE Hydraulic Powertrain, users will experience up to 50% quieter operation, 3X less vibration for smoother operation and faster driving speeds compared to standard impacts. The 2493-24 M12 Cordless 4-Tool Combo Kit includes the M12 3/8 in. Drill/Driver (2410-20), M12 3/8 in. Square Drive Impact Wrench (2451-20), M12 1/4 in. Ratchet (2456-20), and M12 Work Light (49-24-0145).